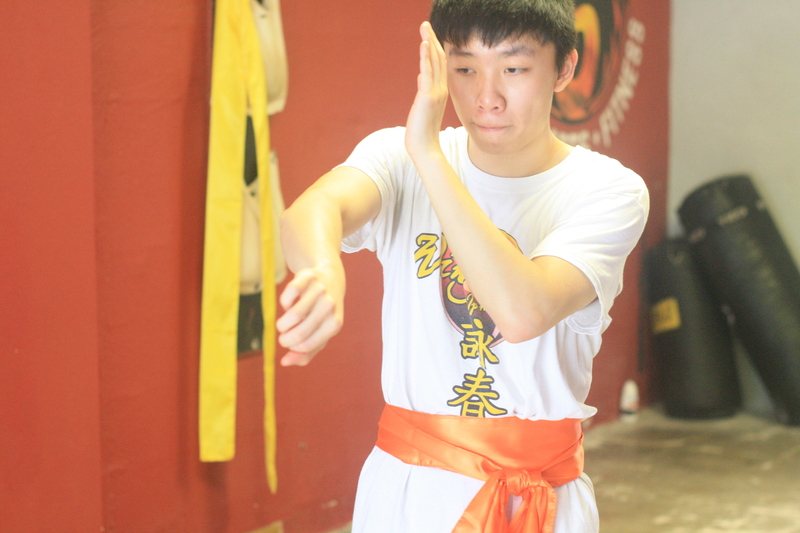 Dixon K. is a college student and has been training in Wing Chun Kung Fu for over a year since May 2016. Before getting into wing chun, I never had much martial arts training. I took taekwondo for a bit but my mom pulled me out not long after I got my yellow belt. This was due to her reading an article that said doing martial arts stunted growth. I personally never believed it, but I was only in I think elementary school and it’s not like I could convince her otherwise. After that I never gave martial arts much thought. Even so I’ve always enjoyed sports and athletic activities so I’ve pretty much tried every sport one could think of over the years. However, because I changed interests so much, I never really joined a team and received formal training. The exception to this was swimming only due to my parents will and not my own. Because of this I grew up to be a rather athletic and coordinated person and learned things rather fast and quickly. Since I did keep switching between sports depending on what was on TV I lacked commitment and because I was usually playing by myself or with friends I would just stop whenever I got tired or didn’t feel like continuing. This led me to a lack motivation to push through when things got too hard because there was no one to force me to keep going and push my limits. A little over a year ago though, I was watching a TV show and one of the characters saved a stranger through the use of martial arts. It sparked a whole new interest in martial arts for me. I talked it over with my friend and he seemed like he was interested in learning a martial art to and that we could probably learn one together. Seeing how I’ve pretty much already finished growing I didn’t see a reason my mom would not allow me to take a martial arts now so I figured it wouldn’t hurt to ask and try out martial arts again. Sure enough she gave me the ok and I started researching, which martial arts I wanted to do. I looked over the usual ones most would hear about in this day and age like karate, taekwondo, boxing, etc. After a bit of research though I decided I wanted to do one that was closer to my birthplace Hong Kong. From that I started up looking for styles of Chinese martial arts and stumbled upon a site that listed a whole bunch of styles of kung fu split into northern and southern styles. often more likely to look cool than actually work in a fight. As I did more research, I found out it was also the martial art that Bruce Lee and Ip Man practiced which helped me get a better idea of what it looked like and how it was executed. I decided to go ahead with this one. My friendended up getting interested in something else and dropping out of our plan but I figured I would do it regardless. Now a little over a year later as I test for my orange sash I am very happy with my choice. The class has become like another family where I can come and progress each week and also have good times with. There is an atmosphere that makes me want to keep pushing and get better and better. Although morning classes on Saturday are often really rough, it’s often worth it. I’m glad to be learning wing chun in this system as unlike many other systems, it is focused on making us fighters instead of belt chasers. It isn’t about just getting to the next belt but making sure I’m actually capable of holding my own if I need to which is why I wanted to learn a martial art in the first place. It has been an incredible journey so far and I will keep going as far as I can.